Years ago, during my college days, I scoffed at craft beer and drank a lot of Hamm’s. Almost every Wednesday for a year or so, a friend and I would pick up a twelver of it, and maybe a bottle of MD 20/20, and sit around and spin Fun House by the Stooges, Patti Smith’s Horses, and The Greatest Hits Of Eric Burdon And The Animals. Eventually the records got beer-splattered and scratched (I’m much more careful now), and I started drinking more expensive beer—not because I had any more money, really, but because I apparently wanted to appear more refined. Hamm’s never fully left my heart, though, and I return to it occasionally. 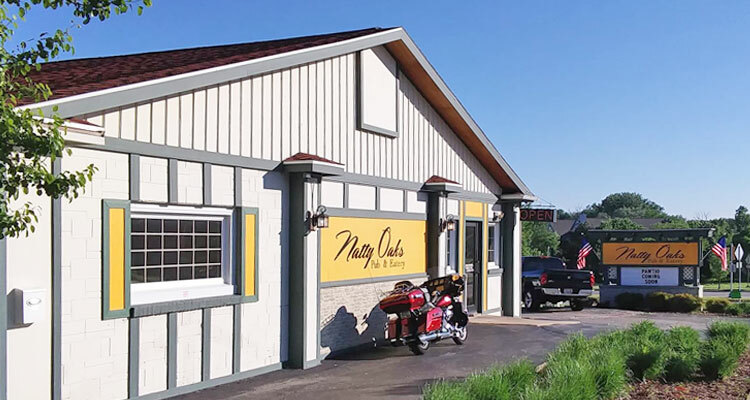 This past Friday, I scanned for open seats upon entering a packed Natty Oaks Pub & Eatery (11505 W. National Ave., West Allis, 414-543-2255), and found one at the bar, next to an older guy in overalls drinking a Hamm’s Tall Boy, who was waiting for his to-go food to be prepared. As much as it would fit the narrative to say that I ordered a Hamm’s, I did not; I ordered an Old Fashioned. It was hand-muddled in a small Old Fashioned glass, and had a balanced flavor to it, being a pretty standard representative of the drink. I perused the seafood menu, which had a decent amount of options. Beer battered cod is available at $9.95 for a two piece meal, or $11.95 for three pieces. And for those who are able to arrive before 5 p.m., the two piece is only $7.95. The other seafood options are pan fried perch ($13.95); baked cod ($12.95); shrimp ($13.95)—battered or grilled; the Big Kahuna Sandwich ($10.50), which is almost a whole fish fry in a sandwich, including two pieces of cod, tartar sauce, and a potato pancake served on rye bread; and the sampler platter ($13.95), which consists of one piece of cod, two pieces of perch, and three battered shrimp. Oh, and if that’s not enough, there is also a la carte fish: $2.95 for a piece of cod, or $3.95 for two pieces of perch. Potato options are chips, fries, sweet potato fries, baked potato (only after 4 p.m.), or potato pancakes for an extra $2.50. I put my order in for the sampler platter with pancakes, as well as a cup of clam chowder. The clam chowder was a little peppery and had big potato chunks, and also had carrots, celery, and a moderate amount of clam. As I dipped into it, and waited for my fish to arrive, I took a look around. The setting was somewhat reminiscent of Coach’s: green was a prominent color, there was a sports bar vibe, and the dining areas could be seen from the bar (although Natty Oaks has a separate “lounge” that can be rented as well). I noticed a guy across the bar was wearing a T-shirt that said “Westallica” on it, and then noticed one for sale as well, hanging behind him on the wall. “I wonder if they say something on the back?” I thought. As the guy next to me was brought his food, he finished up what was at least his second Hamm’s. “Maybe one more Hamm’s,” he told the bartender, “and maybe a quick shot of Jack, too.” “From the land of sky blue waters,” I commented, “I used to drink a lot of Hamm’s.” He downed his shot and chased it with his Tall Boy. The sampler platter arrived, and I could tell by looking at it that it was going to be good. I can’t remember the last time I’ve had shrimp with such enjoyable batter. Instead of being pre-breaded from a box, they looked to be hand-battered with the same homemade batter that was used on the cod. Both the shrimp and cod had a golden luster and light crisp to them. The cod also flaked well, and had an excellent flavor all-around. The perch had a very light breading and a moderately good flavor. I was expecting a bit more from it because the cod had been so good. It’s rare that I enjoy cod more than perch, but that was the case here. Perhaps it was because the perch was pan fried instead of deep fried, or maybe it was because the cod matched so magnificently with the tartar sauce. No matter the case, there wasn’t really anything lacking with the perch, it was just that the cod was a step above the cod you will get at most places. The homemade potato pancakes were mild, and had an understated goodness to them. The coleslaw came in a small container—it was a cream slaw with an inviting strong cabbage taste. The fry also came with a fresh piece of marble rye. After finishing the meal I was quite satisfied, although I do regret not getting one more piece of cod a la carte, so I could have had more than one piece of it. As I got up to leave, I took a few pictures of the bar and the dining area, and someone asked me in a very concerned tone if everything was okay. It turned out it was one of the owners, who shook my hand, and once again asked me if everything was okay, and if it was my first time at the place. I reassured him everything was just fine. I was going to let him know what I was up to, but then I noticed he had on one of the Westallica shirts, so I started asking him about that instead. It turns out the staff sometimes wears them, but anyone can buy them at the bar. He also showed that there is writing on the back, signifying the shirts are from Natty Oaks. And with that I was out the door, and ready to face another week, until the next Friday arrived. Takeaways: Excellent cod with great batter and taste, and you can buy extra pieces whenever you want; batter on the shrimp was great as well; decent perch; homemade pancakes; early bird fish fry served 11 a.m.-5 p.m, where you get $2 off the two piece cod price; you can buy Westallica T-shirts here and they have the bar logo and name on the back of them; there is an outdoor patio for humans, and there is soon to be one for dogs; on Wednesdays they have yoga and all you can drink wine for $20; they have a decent amount of craft beers, but they also have Hamm’s Tall Boys, as well as Pabst 32 ounce big boy cans for $5.75; there was an older couple sharing a fish fry a the bar and it was adorable.